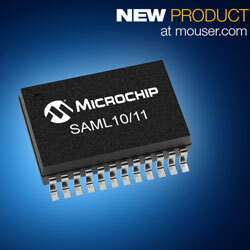 Mouser is now stocking the SAM L10 and L11 microcontrollers from Microchip Technology. The microcontrollers are based on a 32-bit Arm Cortex-M23 core and feature picoPower technology to provide what is claimed to be the industry’s lowest power consumption in their class. The SAM L11 variant adds integrated hardware security and is the first 32-bit microcontroller family to feature Arm TrustZone Technology. These microcontrollers run at 32MHz and feature up to 64Kbytes of flash memory and up to 16Kbytes of SRAM. The SAM L10 devices employ a single MPU, two DALs, whereas SAM L11 devices employ two MPUs, three DALs, and TrustZone for ARMv8-M, a programmable environment that gives hardware isolation between certified libraries, IP and application code. The microcontrollers provide flexible clock distribution optimised for low power and a 32.768kHz crystal oscillator as well as power-on-reset, programmable brown-out detection, 8-channel DMAC, and 8-channel event system for inter-peripheral core-independent operation. Both microcontroller families offer the company’s PTC for capacitive touch capabilities even in the presence of moisture and noise. The microcontrollers are ideal for a range of low-power applications, including IoT, security, automotive, embedded control, medical and other HMI designs.